Unmatched Experience and Buying Power. Over the past 20+ years, Travel Selection has established strong relationships with the best hotel and airline companies, resulting in superior service and lower pricing for you. Plus, you'll enjoy exclusive "Value Plus" offers. 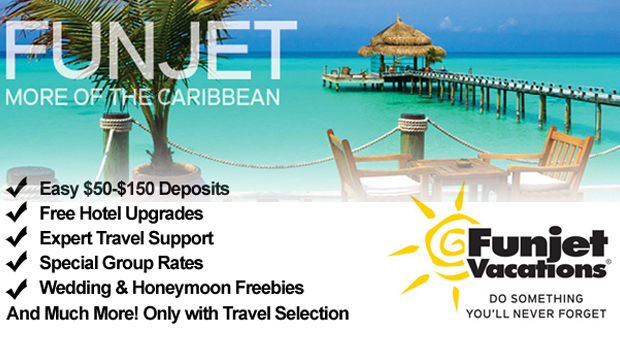 With Apple and Funjet Vacations, value isn't a cliché...you get more for your hard-earned vacation dollars. Enter Promo code "5DAY415" at time of booking to save! Save up to $100* per couple ($50* per adult) on your new air package or hotel only vacations travel 6-14 nights at select hotels & resorts! We've been around a long time, and we know what you want–non-stop vacation flights, the most desirable flight times and the widest range of accommodations to fit your own preferences and budget. 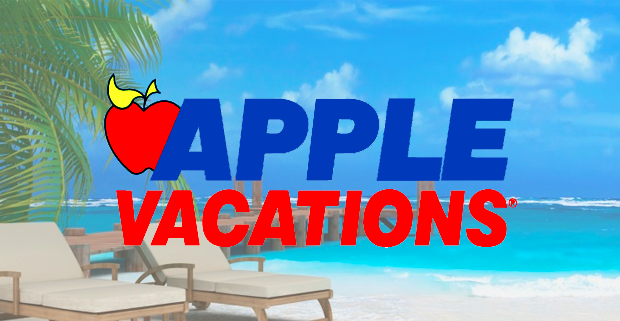 It's no wonder that Apple Vacations sends more leisure travelers to Mexico and the Dominican Republic than any other vacation company worldwide. From the tropical sun of Mexico, Costa Rica, the Caribbean and Hawaii, to the most popular ski slopes in the USA and the most amazing sights of Europe, Travel Selection has it all! 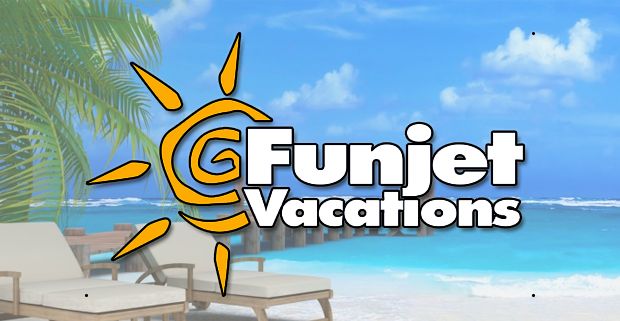 From the moment our Apple and Funjet Vacations Resort Representatives* meet you outside your resort airport until the time you depart, friendly and professional Apple and Funjet Reps are available to help ensure your complete satisfaction. 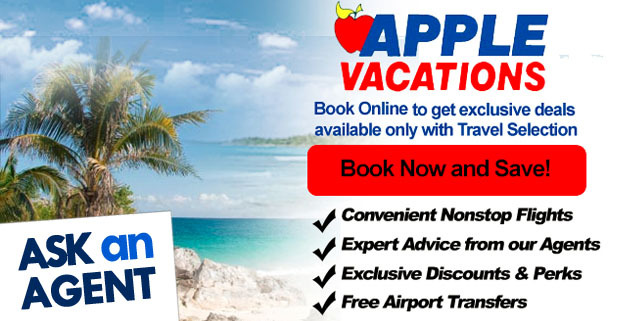 And, with Apple and Funjet Vacations' exclusive Value Plus features, you always get more than what you pay for. We survey our customers and listen to what they have to say. In fact, Travel Selection is the only vacation company to rate hotels based solely on the feedback of our customers. Perhaps that's why more than 70% of Travel Selection's loyal customers always return.Our experienced staff will be happy to answer your questions, provide technical support if needed, and ensure that you find exactly what you're looking for. Now that's truly "Service Beyond the Click"! Our agents have the opportunity to travel through the year learning about the destinations and resorts as well as attending trade shows and training. You have questions, and the'll have answers for you because they know first hand what the catalogs and brochures aren't telling you. Oftentimes when calling a mass travel website, you'll get an automated answering system. We know what a great feeling it is to get a person on the phone and if you should have any problems with your travels, then it's all the more important to know expert support is just an easy phone call away. Not only are we easy to reach, we also know what to do and how to best minimize a crisis. We're confident we have the best prices, but if you happen to find a better price, we guarantee to beat the lowest comparable quote from any competitor. * Our unique partnerships give you access to the lowest fares and vacation packages. Our expert agents will enlighten you about trip options you may not be able to find online. We know you don't want to travel like a tourist...that's why we're here to help you find unique life experiences that you'll remember forever. We provide elite vacations carefully crafted to meet the individual needs of people with a specified travel purpose and a desire to experience the finest resorts that Mexico, the Caribbean and Hawaii have to offer. .
© 2016 Travel Selection. All Rights Reserved.